Rick and Boy visited the infamous Bungsamlan Lake in Bangkok. Using a goldfish livebait Rick hooked the largest fish of his life. A fraught twenty minute battle ensued which saw the monster fish gain the sanctuary of the snags on several occasions causing the anglers to retie the mainline and resume the battle on another rod! 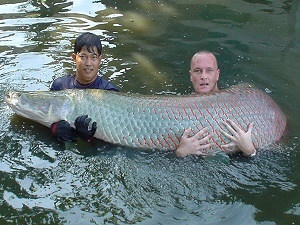 The gigantic Arapaima was finally landed and weighed in the excess of 145kgs. 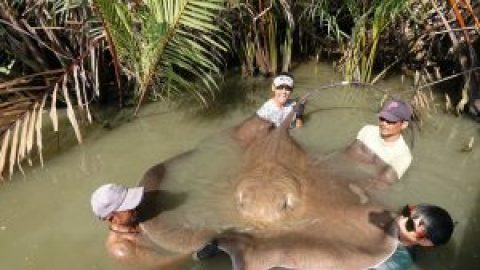 With an overall length of 2.4 metres and a girth measurement of 1.75 metres at its widest part this fish was truly a capture of a lifetime! This fish was identified as one of the original stocking of Arapaima?s which would place an age of almost twenty years on this ancient warrior!